John Winston Clark was diagnosed with Parkinson's disease in 2006 and he has been battling this degenerative disease as it has progressed the past 13 years. 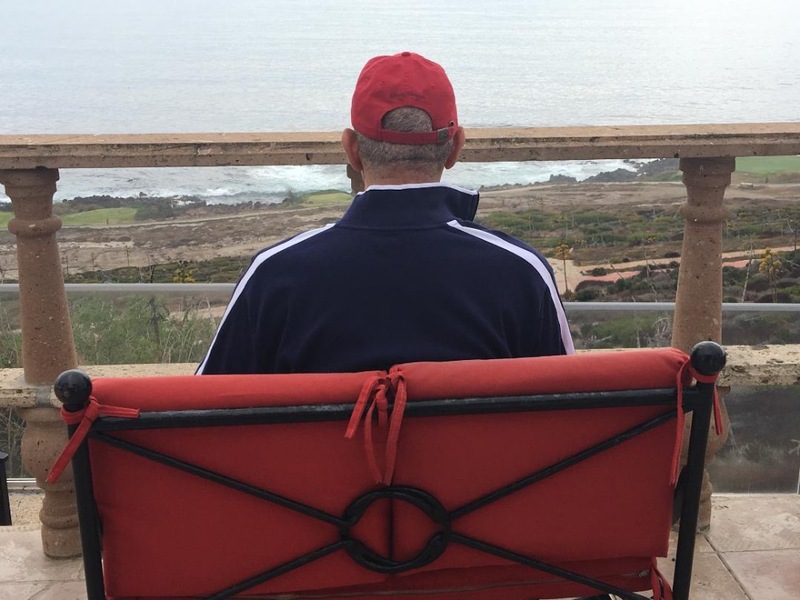 Despite actively pursuing all the options made available to him to treat Parkinson’s by his doctors and through mainstream medicine, he has not been able to slow or manage the disease’s debilitating effects. John hopes that by pursuing alternative medicine treatments including innovative stem cell treatments can not only slow the advance of Parkinson’s and improve quality of life, but also help pave the way for new treatment options for others suffering from Parkinson’s disease. 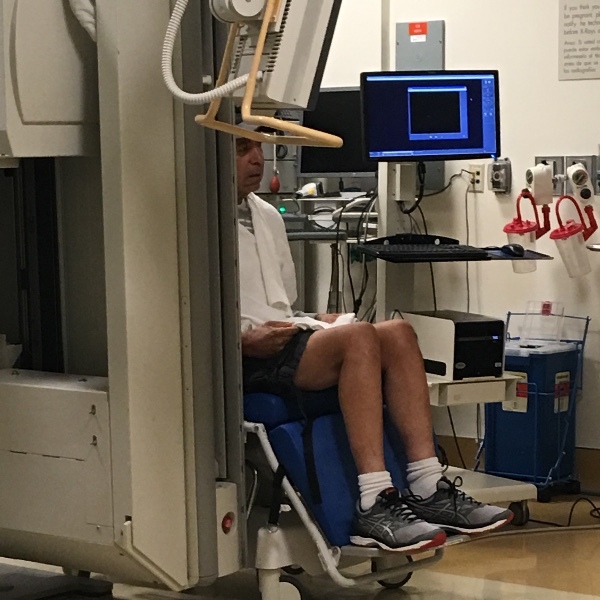 John’s journey to battle Parkinson’s began in the early stage of his diagnosis and included his intent to pursue one of the most commonly used Parkinson’s surgical therapy treatments, Deep Brain Stimulation (DBS). DBS is recommended when Parkinson’s patients are having minimal results from medication and it uses a small, pacemaker-like device, placed under the skin of the chest, to send electronic signals to an area in the brain that controls movement to provide patient relief by blocking signals that cause the motor symptoms of Parkinson’s. After being informed that his Parkinson’s was advancing too fast and he would not be a candidate for DBS, and after experiencing only minimal results with his medication, John has been actively looking into other treatment options proposed by his doctors including a new FDA approved treatment called Duopa. Duopa is not a pill – it is a suspension form of carbidopa and levodopa that is delivered continuously into the intestine over 16 hours through a tube from a small portable pump worn throughout the day. The downside of Duopa is that it has some severe side effects that compounded with the progression of Parkinson’s could further impact quality of life. Based upon extensive research, John now believes that the best hope to successfully treat Parkinson’s may be provided by more innovative approaches to medicine like that recommended by Dr. Beth McDougall at the CLEAR Center of Health. Dr. Beth McDougall specializes in helping patients with neurodegenerative diseases by combining Western medicine with Naturopathic, Functional, and European Biological medicine, Psycho-emotional integration, and the latest advances coming out of Quantum medicine. Currently, Dr. Beth McDougall is recommending John consider undergoing the stem cell treatments to treat his Parkinson’s that are being offered by Dr. Hino, PhD., who runs the Hino Medical Center Ensenada, Mexico. Other patients she has referred to Dr Hino have been able to reduce their current medication dose by 2/3 of their initial dose and have seen huge improvements as a result of the treatment. Dr. Hino is thought of very highly by his patients who all claim that they are not necessarily cured, but feeling much better thanks to his treatment. Dr. Hino attended Cal Tech in Molecular Biology and his Doctorate is from the Molecular Laboratories in Cambridge, England, where he did stem cell research. He has achieved impressive results in treating patients with Parkinson’s and has improved the quality of life for his patients. John hopes to obtain treatment by Dr. Hino as soon as April 2017, so that he can successfully arrest the degenerative symptoms of Parkinson’s, reduce his medication intake and the associated side effects, and most importantly improve his quality of life. As of today John Clark is taking a total of 52 medications per day: 26 pills per day just for Parkinson’s, 3 pills per day for other issues, and 23 Natural Pill Drops per day. In addition his symptoms are progressively getting worse. Please help John become a success story and an example that provides hope for others suffering from Parkinson’s. You can help by contributing to the GoFundMe page dedicated to John to help him receive treatment from Dr. Hino, Phd., at the Ensenada Health and Wellness Center in Mexico. John Winston Clark is a native Californian with a long record of contribution. John served in the United States Navy over the course of 27 years and earned numerous military awards and decorations during his years of service. Navy Commendation Medal; Navy Achievement Medal; Battle Efficiency "E" (3rd); Good Conduct Medal (4th), National Defense Medal; Armed Forces Expeditionary Medal; Sea Service Deployment Ribbon (3rd); Overseas Service Ribbon; Recruiting Service Ribbon (with star); Command Senior Chief Badge; Recruiting Badge with gold wreath and stars; and Career counselor Badge. - Honorable transfer to the Fleet Reserve on January 30, 1990. John was born in Los Angeles in November 1943, he graduated from Castlemont high school in Oakland in 1961. He begin his career and served in the United States Navy and the Contra Costa Sheriff Department. April was Parkinson’s Awareness month and we were blessed to have John’s story showcased on KRON4 NEWS! I hope that you all have had a wonderful Easter Weekend. Today is April 2nd, 2018 and April is a huge month for me and the Parkinson's Foundation we ask that you pay special attention to JWC this month. Support our mission to make life better for people with Parkinson's. Your gift will help us improve care and advance research toward a cure. Everyday this month we will be posting information so you can better learn about the disease, signs, treatment options, care, and ways you can get involved. 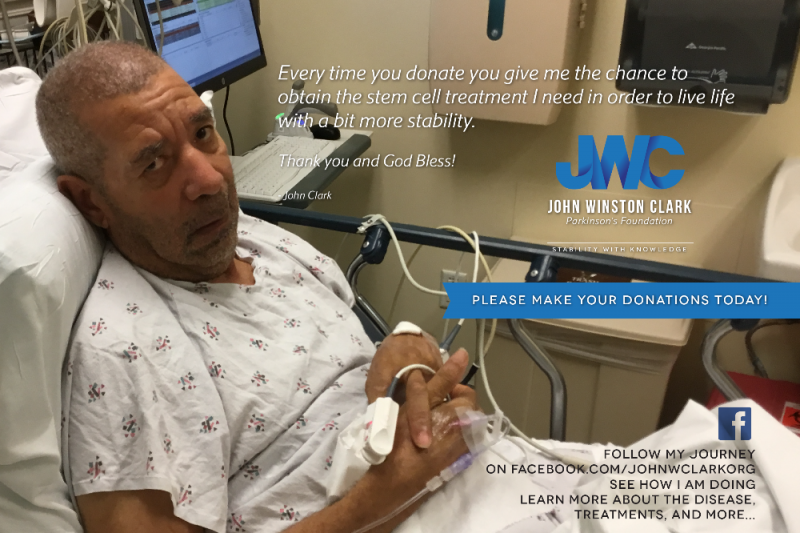 Please donate today so that John is able to continue with stem cell treatments. Each and everyday is a blessing. The throat closes up with Parkinsons, Stem Cells help keep it open to swallow. John is checking his swallowing and showing improvement.